This amazing side is based on an original recipe on epicurious and is a fantastic pair for cold weather comfort food! 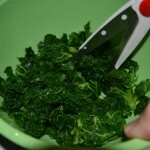 Squeeze thawed frozen spinach in small handfuls to remove excess moisture, then coarsely chop and transfer to a bowl. Melt 3 tablespoons butter in an 8-inch heavy skillet over moderately low heat, then cook onion and garlic for 3-5 min stirring periodically. 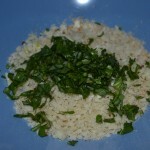 Add onion mixture to spinach along with salt, pepper, nutmeg, and cream and stir to combine. Cut squash to separate bulb section the straight neck section, then cut pieces in long strips into 1/8-inch-thick slices. Take good care as butternut squash is awkward and easy to cut yourself. 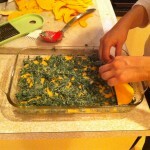 Layer squash and spinach mixture in baking dish 13 x 9, using about 1/5 of squash and 1/4 of spinach for each layer, beginning and ending with squash. 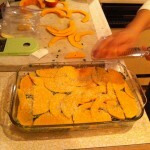 Sprinkle top layer of squash evenly with cheese and add remaining 2 tablespoons of butter, then cover directly with wax paper. Bake 25 to 30 minutes until squash is tender and filling is bubbling. Uncover and bake gratin another 10-15 min until browned slightly. 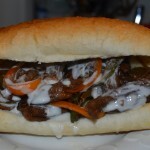 Got this recipe courtesy of the NY Times and it rocketed to the top of our favorites list. Enough said, just make it and reap the rewards! We bought our beef at Costco and cleaned it ourselves. That keeps the cost down. 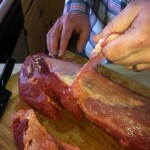 For more on cleaning a tenderloin, this video is helpful. 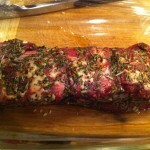 Season the cleaned tenderloin all over with the salt, pepper, rosemary and garlic. 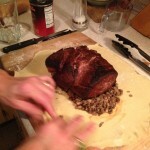 Cover the meat and refrigerate for at least two hours and preferably overnight. 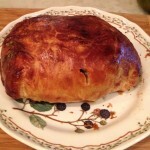 Let it come to room temperature for 1 hour before roasting. In a large, ovenproof skillet over high heat, heat the oil. Add the meat and thoroughly brown all over, 4 minutes per side. Place the skillet on the oven’s middle rack and roast until an instant-read thermometer shows 120 degrees (for rare), 10 to 20 minutes. Let the meat rest for 10 minutes before carving. In a small bowl, whisk the crème fraîche, horseradish, orange zest and crushed red pepper. Let the mixture sit in the fridge for a few hours so the flavors can assimilate. We adapted this recipe from Cooking Light and it was a perfect weeknight dish with amazing flavor. To prepare chicken, place each chicken thigh between 2 sheets of waxed or parchment paper; pound to 1/2-inch thickness using a meat mallet. 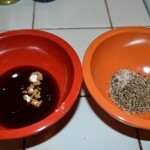 Combine soy sauce and next 5 ingredients (through garlic) in a large bowl or zip-top plastic bag. Add chicken to soy sauce mixture and marinate in refrigerator 30 minutes, turning bag occasionally. 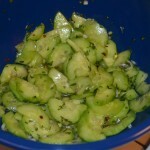 To prepare cucumbers, place cucumber slices in a colander/strainer; sprinkle with salt, tossing well. Drain for 1 hour. 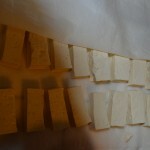 Place cucumber slices on a few layers of paper towels; cover with additional paper towels, pressing down occasionally. Combine cucumber, shallots, and next 5 ingredients in a large bowl; mix gently. Cover and set aside. Heat a grill pan or griddle over medium-high heat. 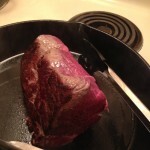 Coat pan with cooking spray. Remove chicken from bag; discard marinade. Place 4-6 thighs in pan; cook 6 minutes on each side or until done. Repeat procedure with remaining thighs if necessary. 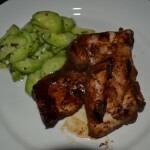 Serve 2 thighs over a bed of cucumbers and enjoy! 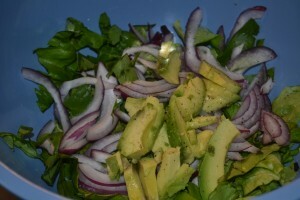 Mix the red onion, salt, pepper, olive oil and lime juice in a bowl and let sit for 10-15 minutes. 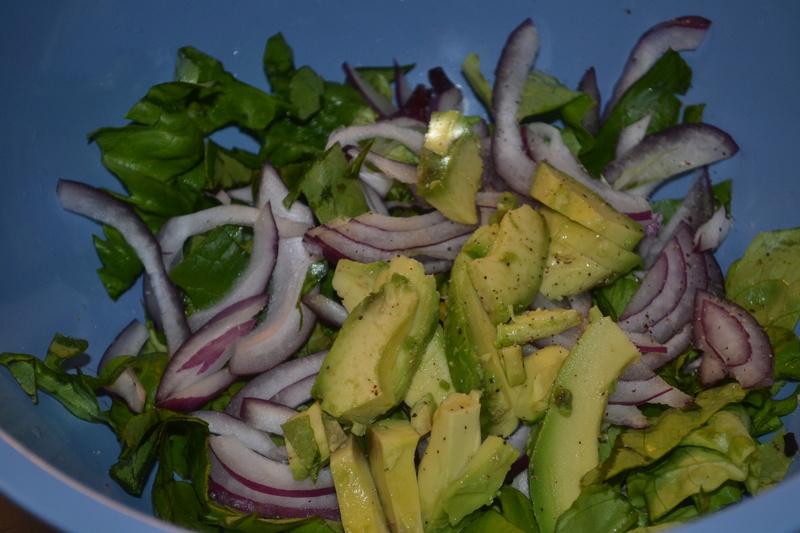 Add Lettuce and avocado and toss gently so the dressing is evenly distributed. 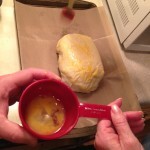 Melt butter in the bottom of a medium sauce pan under medium heat and add oil. 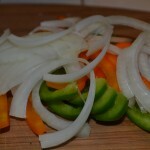 Drop in onion and begin to sweat for 1-2 minutes. 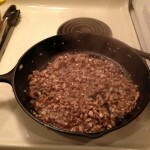 Add in minced garlic and stir frequently to ensure onions cook evenly. Now add the seasoning and stir for 15 seconds. This will help the aromatics of the dried seasoning. Add crushed tomatoes and lower to a simmer. 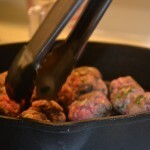 Combine seasonings, garlic and beef in a large bowl and mix using your hands. Add the egg and continue to mix the meat so the seasoning is spread evenly throughout. 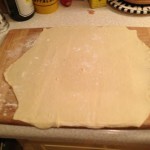 Shape the mixture into even balls roughly the size of a golf ball. Heat the olive oil in a large skillet over medium-high heat. 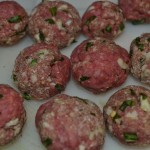 Add meatballs, cook 5 minutes browning on all sides. 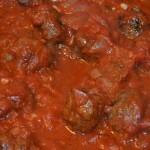 Reduce heat to low and add marinara. 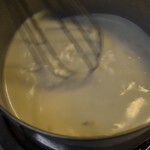 If necessary, use some water from the pasta pot to add liquid. Cover and cook for 11 minutes (perfect time for cooking the pasta). 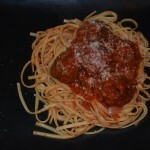 Serve over linguine and enjoy! We adapted this recipe from a recommendation in the NY Times, and one important point is that kale is a great choice for stir-fry because it retains its texture. 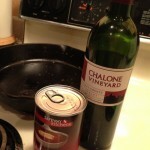 Bring a medium sauce pan to a boil (lightly salted). Add the kale and blanch one minute. Transfer to a bowl of cold water, drain and squeeze out excess water. Chop coarsely and set up in a bowl near your wok. 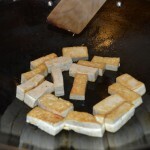 Lay the slices of tofu flat on a paper towel and cover with another layer of paper towel. 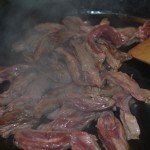 In a small bowl combine the soy sauce, stir fry sauce, rice wine vinegar, stock and corn starch. 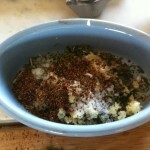 Combine the salt, pepper and sugar in another small bowl. Have both bowls in arms reach of the wok. 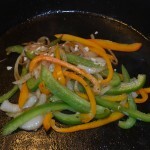 Heat a 14-inch wok or a 12-inch steel skillet over high heat until a drop of water evaporates immediately when added. 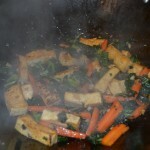 Swirl in the oil at this point, coating the lower sides of the pan and swirling the pan to coat the bottom then add the tofu. Stir-fry for one to two minutes and/or until they begin to brown. 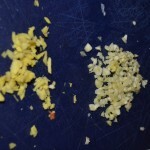 Add the garlic and ginger and stir fry for no more than 10-15 seconds. Add the carrots and stir-fry for 1 minute. 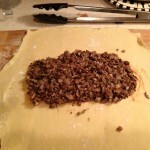 Then add the kale, salt pepper and sugar and then toss together. 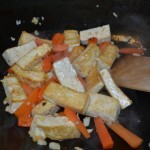 Add the soy sauce mixture and stir-fry for another 1-2 minutes. 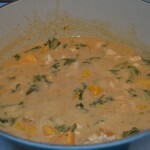 Remove from heat, and serve with noodles or rice. 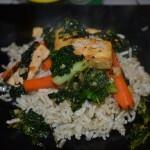 For this meal we went with a basic brown rice. 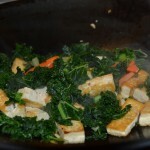 Another note from the original recipe is that blanched kale can keep in the refrigerator for up to 4 days. Preheat oven to 350 degrees. 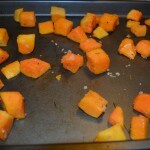 Toss butternut squash codes with olive oil, garlic, salt & pepper. When oven is ready roast butternut squash for 10 minutes until slightly soft. On medium heat in a large stock pot, cook onion and garlic in olive oil. When translucent, add chicken stock and bring to a boil. 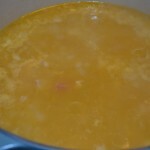 Reduce heat and add chicken (raw), then cover and simmer for 20 minutes. The chicken will cook in the soup. 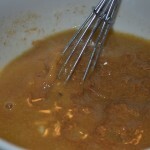 In a small bowl, whisk together the almond butter and 1/2 cup of the existing soup mixture. 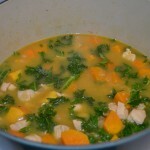 Add the kale, ginger and squash to the soup and return to boil. Reduce heat and simmer, covered, for 5 minutes. Stir in the almond butter mixture and then season with salt and pepper. Let soup continue to cook to make sure that greens cook through. When soup is ready, ladle into bowl and squeeze lime over soup. Do not forget the lime, this is an incredible flavor addition to the soup! Add almond butter to make a creamy soup! 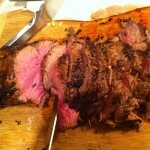 This recipe is something you can do on a grill, a smoker or in the oven. Since it is Winter we opted for the oven. The can of beer helps the chicken retain moisture while it cooks but it can easily be substituted using a can of chicken broth if desired. 1/4 Cup of savory rub, the ingredients are up to you. 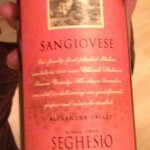 1 Tbsp of olive or grape seed oil. First preheat the oven to 350 or fire up the grill arranging the coals for an indirect heat set up (where the coals are piled to one side of the grill so you can place the chicken in the area where it won't be directly over the hot coals.) If you are using a gas grill, you can set up for indirect heat using the outside burners and leave the center burner off. 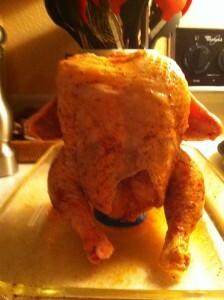 Rinse the chicken thoroughly with water inside and out and coat with oil. Take your rub and massage it onto the chicken on all sides and inside the cavity, be sure to save about a teaspoon of the rub to put in the can. Use your fingers to separate the skin from the breast slightly and get some of the rub in the space between the skin and flesh. 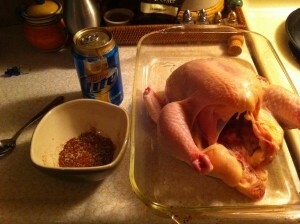 Now that the chicken is seasoned, use a can opener to cut off the top of the beer can and carefully drink half (or spill it out to mother earth) and sprinkle the remaining rub into the beer and stir. Now you are ready to stand the chicken up on the can. In a medium roasting pan, place the can in the center and carefully lower the chicken onto the can and use the can and the chicken's legs to prop up the chicken. Arrange the racks in the oven so you have clearance to slide the pan in and set the timer for about an hour and a half. I usually roast the chicken for the first hour at 350 and then lower the temperature to 325 for the last 15-30 minutes. 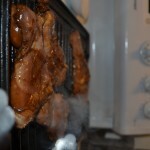 Remove the chicken and the meat temperature should be 170 in the breast and 180 in the legs. Let the chicken rest for at least 10 minutes before carving.